A decoration and book in one! 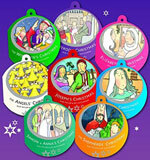 The Bauble set of books retell the Christmas story from the different view points. The beautiful artwork makes them attractive Christmas tree baubles as well as a great read for children under 8. The books come with a thread to hang them on a Christmas tree. The Bauble Books set of 8 covers the stories of the 1st Christmas as experienced by Mary, Joseph, the shepherds, the wise men, the angels, Elizabeth, Herod, Simeon & Anna. The whole collection looks very attractive hanging on a Christmas tree. The stories are age appropriate for under-8s and sticks closely to the Bible in its retelling. It is ideal for use with all children, but is good to introduce the real Christmas story to those with little or no church background.